CHENNAI : In the words of bestselling author Paulo Coelho, ‘And, when you want something, all the universe conspires in helping you to achieve it.’ Classical dancer Jagyaseni Chatterjee’s life testifies this. Jagyaseni was awarded the Natya Ratna by Trinity Arts at Rasika Ranjani Sabha on Friday. Her story to glory is dotted with grit and determination.“I was five years old and at the dinner table, my brother asked what I wanted to become and my immediate reply was, ‘dancer’. My mom signed me up for different art classes including music, dance and art. I was so drawn to dance because it merges all kinds of art onto one platform — be it theatre, architecture, or history. 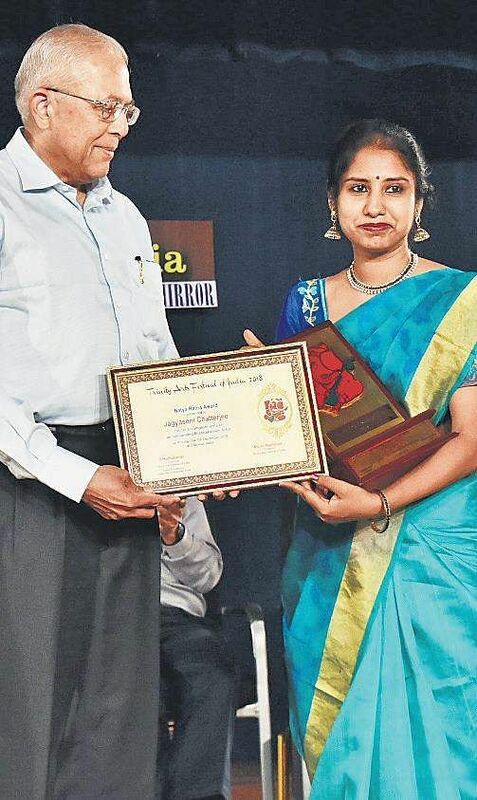 Today, I am here receiving my first award in the city,” says Jagyaseni, who set the record for the first solo crowdfunded Bharatanatyam recital in Tamil Nadu in 2017. “When I got an opportunity to perform, I did not have enough funds, so I opted for crowdfunding. It was a great experience communicating with different people to draw money. Within three weeks, we raised `60,000 online and `20,000 offline,” she gleamed. Despite being the daughter of prominent Indian actress, Soma Dey, who is known for her successful performances in Bengali cinema, Jagyaseni refused to use her mother’s legacy to rise to popularity. In 2012, she used all her savings to book a flight ticket to Chennai and landed in the city with just `17 in her pocket. “I told my mother that I have a friend who would take care of me, when in reality there was nobody and I did not know a word of Tamil. I lived in a ladies hostel at Besant Nagar and had three bananas, a day. By then, I had completed MA in Human Rights at Calcutta, so I started working at a firm as a communication manager,” she recalls. The turning point in Jagyaseni’s life arrived when she accidentally met Dr Lakshmi Ramaswamy, a renowned Bharatanatyam dancer and a guest faculty for MA Bharatanatyam course in the Music Department at Madras University. “She has been training me, and I live with her now. So, I practice dance every minute of the day. We either discuss about it, do a rehearsal or I observe her teaching somebody. Observation, according to me is one of the most important aspects of learning dance. You get a different perspective altogether,” shares Jagyaseni. Never fazed by challenges, Jagyaseni is a font of willpower. From a time in 2012, when she did not have money to buy a ticket for Margazhi shows, she has three performances lined up this year at Bharatiya Vidya Bhavan for Karthik Fine Arts, RR Sabha for Trinity Fine Arts and at Brahma Gana Sabha. Despite being the daughter of Indian actress, Soma Dey, who is known for her successful performances in Bengali cinema, Jagyaseni refused to use her mother’s legacy to rise to popularity. In 2012, she used all her savings to book a flight ticket to Chennai and landed in the city with just `17 in her pocket.